Creek View is an attractive and welcoming stone terraced self-catering cottage, one of 8 in a converted malthouse, with exceptional views down a tidal creek bordered by woodlands. The properties have their own private drive. Creek View has 2 car parking places in front; there is an adjacent slipway that provides easy access to the creek for water sports. Inside, the cottage is decorated to a high standard and is well-equipped. There is unlimited broadband. To make the most of the spectacular views it is on 3 floors with an entrance hall and twin-bedded room with ensuite shower and loo on the ground floor; lounge/dining room with balcony and separate kitchen on the middle floor. The main bedroom with wonderful views down the creek and a second twin-bedded room and bathroom with hand-shower and loo are on the top floor. Guests can enjoy the varied bird and water life from the small west-facing balcony off the lounge and watch the tide as it ebbs and flows. 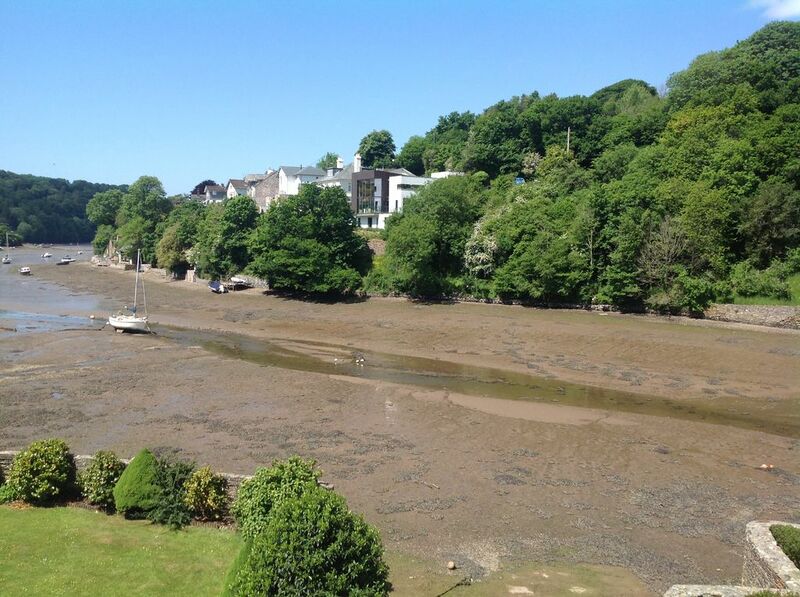 Creek View is well located at the head of the creek separating Noss Mayo and its twin Newton Ferrers. Both are picturesque sailing villages at the mouth of the beautiful Yealm estuary 10 miles from Plymouth. There are excellent pubs including The Swan, The Ship and the Dolphin offering home made food and are within walking distance. At low tide you can walk across the Voss from Newton to Noss . When the tide is in children enjoy crabbing from the jetty below The Swan . The Co-op and the Community shop in Newton Ferrers cater for most needs. Ben's Organic Farmshop at Yealmpton specialising in locally produced food has dishes available to eat on the premises or to takeaway. Modbury has a good variety of independent shops, pubs and restaurants and is a good place for present buying. Cellar and Stoke beaches are within easy reach. Mothecombe with its new restaurant specialising in sea food is a 15 minute drive . The beach at Wembury is popular with guests , especially children who enjoy its rock pools and small museum. For walkers there is the nearby South West Coastal Path providing spectacular views down the Yealm estuary and of the Mewstone. The Dartmoor National Park is always worth exploring. National Trust properties in the area include Saltram, Killerton, Cotehele, Overbecks and Colleton Fishacre. Greenways, once owned by Agatha Christie borders the River Dart and offers a unique insight into her times. It can be reached by ferry from Dittisham, Dartmouth or Totnes , by road and by steam train from Kingswear or Paignton. The National Marine Aquarium is at Plymouth. Golfers can enjoy the excellent golf courses at Bigbury, Thurlestone, Dartmouth and St.Mellion . Noss Mayo has 2 tennis courts while at Ivybridge there is the South Devon tennis centre with indoor and outdoor courts. Close by is the Ivybridge sports centre with indoor swimming pool, gym and badminton courts. For a day out guests can use the leisure facilities at the Dartmouth Golf & Country Club (jacuzzi, fitness centre, indoor swimming pool and 2 golf courses) at a reduced fee. Changeover details: The property is available on a Friday - Friday basis. Guests are asked to arrive after 3pm and to depart before 10am. Bathroom: Small bathroom on top floor of property with sloping roof. Skylight window. Medium sized bath with hand shower. Wash basin, glass shelf and mirror. WC. Next to twin bedroom and close to main bedroom. Downstairs en suite shower unit and WC. Stand alone shower area and separate WC in spacious downstairs twin bedroom. The dining area is at the back of the lounge close to the kitchen. Table and chairs for 6. There is a communal lawn and shrubs inside the sea wall Garden chairs can be found in the store room. A small balcony with 2 seats and table looking up the creek and getting the afternoon / evening sun. The views are spectacular whatever the state of the tide. Night storage and electric heating Suitable for active elderly. Would also appeal to couples who want to get away from it all, especially those who enjoy walking Downstairs off 3rd twin-bedded room is a boathouse/storage area (ideal for bicycles, water sports gear etc) with tumble drier and second freezer. Off-street parking for 2 cars in designated parking spaces in front of property. Two other properties in the Malt houses are available for holiday lets and may be considered if a party bigger than 6 wish to holiday together. Both have the same views looking up the creek. This converted malt house is beautifully situated on the estuary, so the views from the first floor living room are spectacular. A real bonus is being able to park right outside. Noss Mayo has 2 great pubs and is incredibly picturesque.. we used the cottage as a base to walk some of the coastal path and coming back to this lovely setting in the evening for a glass of wine while watching the boats and estuary live was brilliant. Creek View is located in a beautiful, very peaceful place, right next to a scenic Creek and estuary. The accommodation was clean and has everything you need, with clear and detailed instructions. We enjoyed a lovely week at Creek View. The location of the property is idyllic with easy walking distance to the co-op and post office. The view from Creek View is stunning. Having easy access directly from the property to the slipway was great as we spent a lot of time kayaking on the river. I understand that the property itself is undergoing updating, which is great as it currently feels quite tired and dated in places. All in all we had a lovely holiday and would definitely return to Noss Mayo/Newton Ferrers. Unfortunately Creek View will never compare to the next door property where our guests had previously stayed, where no expense was spared on complete renovation of the property by the former owners. Investment has been made this year on renovating the downstairs bedroom and shower / toilet facilities; also the internal and exterior of the property was repainted in May. Improvements will be made on the upstairs bathroom next year. As the reviewer states the location is 'idyllic'. If you want a property where water location/views are key, Creek will always score 5 out of 5 . The cottage was well equipped, and we particularly enjoyed the dvds and games. Everything was in working order apart from the upstairs toilet which is leaking from the cistern and does not flush properly. We were two in the house which could sleep six, so we had plenty of space. No private outdoor area but a small communal lawn in the front. Very nice view of the creek from the small veranda. Noss Mayo and Newton Ferrers face each other across a creek in the beautiful wooded estuary of the River Yealm, a haven for lovers of the English countryside with its appealing waterside cottages and local pubs. A variety of sailing dinghies and smaller boats create a colourful scene for all who visit. Newton Ferrers is popular with visiting yachtsmen during the summer and together with Noss Mayo boasts several delightful waterside restaurants to complete the atmosphere. A ferry connects Newton Ferrers with a secluded cove and the well known South West coastal path. Golf: John and Jennifer are members of Bigbury Golf Club (see ). Other courses within the area are Staddon Heights, with good views over Plymouth Sound (see ), Thurlestone (see), Dartmouth Golf & Country Club (discounts available), Wranagton GC (see), Yelverton (see) and St Mellion Championship and Old course, over the Tamar Bridge and into Cornwall (see). There is a well-appointed golf driving range at Plympton (for details see). Multiplex cinema, restaurants and ten-pin bowling ( ) at Barbican Centre Plymouth. Reduced rates may be available outside of the main holiday periods for couples. Rental rate includes electricity. Towels and linen not included charged at £12 per person per week Our preference is to book Friday- Friday but may accept Sat-Sat bookings. Creek View sleeps 6 comfortably for a combination adults and children. The property is best for no more than 4 adults, 5 maximum.